My heart has been arrested by God’s deep conviction on my heart. One of those areas includes my words, conversations, and joking. Everything I say now, I feel like I have to double check and make sure it is something that is worth saying. Not everything we think, we should say. Believe me, I am the first to admit having a lot to say…yet having to learn to not always talk. 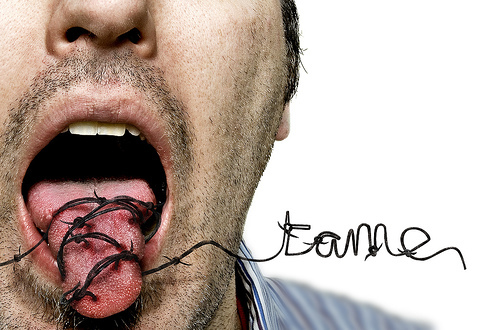 God has been teaching me to tame the beast inside me…the tongue. Our very way of communicating to each other, God is telling me to contain it. Control it. Teach it to be submissive to what is right and tame it. This is a constant struggle for me. Words can hurt. We all know this. At some point words have cut deep into our core and stab us as if a knife. Words can painfully penetrate the insecurities and doubts within someone’s life. You and I have the power to uplift, respect and bring even life to someone with our words and conversations. However, the other side of this is that we also have a very powerful weapon against others that is very hard to tame. Though the first option is best, the second is far more common. The tongue is a weapon, a sword that cuts through someone bringing deep wounds that will become scars. Simple jokes, gossip, slander… Our words can murder. Can destroy. Can forever ruin. Gossip is poison that leaks from our lips. Life or death, a words will make that difference. You choose… life or death. Will you let your words honor others? Build them up? Edify? Encourage? Or will you speak death over others? Coarse joking? Gossip? Hatred? Scientists say that the tongue is, if not the strongest, among the strongest muscles in the human body. How will you use that strength? I hope and pray that this affects you and causes you to, at least, evaluate yourself and your tongue. I desire to love God fully and with my all… that definitely needs to include my speech, words, conversation, joking… if not I am simply living a lie. Only a Pharisee. How do your words, conversations, and jokes affect others? Even more… how do they truly affect you?